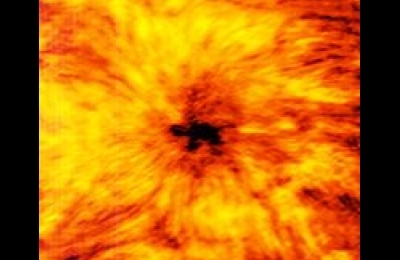 The Sun has long been known to go through eleven-year cycles of high and low activity, including sunspots, which Strugarek likened to solar volcanoes. As the magnetic disruption from a sunspot approaches Earth, it can intensify the Aurora Borealis and Australis but it also dings the performance of satellites and power grids. During these periods, the sun's magnetic poles flip. A hypothetical heat-proof compass at the surface of the Sun would point toward one pole during one eleven-year period but toward the other during the next. To predict and explain this activity, Strugarek and colleagues developed a model of the plasma, high-energy matter, inside the sun and examined how its flow and change could create magnetic fields. To build this model, they incorporated data from at least 25 different stars. They found the Sun operated on the same basic principles as other stars: The activity of all stars in the system was found to be driven by their luminosity, their rotation, and nothing else. The luminosity and rotation are used together to determine a star's Rossby number, relating to plasma flow. The smaller the Rossby number, the less active the star was with respect to magnetic changes.